The University of Zurich EMBA is designed to accommodate the pressures of high-achieving professionals. 12 immersive modules, on average 6 days per module, are spread over 14 months to give you the flexibility to manage your career and personal life while enjoying the transformative learning experience of an Executive MBA. 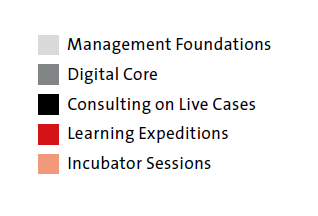 8 foundational modules take place at the University of Zurich in Switzerland. 4 additional learning expeditions immerse you in innovation hotspots around the world, including the East Coast and the West Coast of the USA, China, Israel, and Switzerland.